I love roasted vegetables and recently decided to try them in a breakfast casserole. It was a great idea! This hearty casserole has potatoes, bacon, vegetables, eggs and cheese - it is super satisfying and delicious. And leftovers are equally good for lunch as for breakfast! This would also make a hearty dinner. 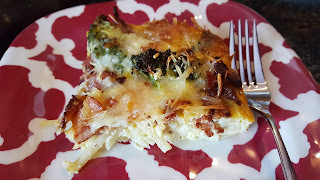 I especially like to have breakfast casseroles when entertaining overnight guests as they can be made ahead of time and just baked in the morning. Do be aware that you'll likely need to bake this one slightly longer if it comes from the fridge - but that's just more time to drink coffee and/or make muffins! Start the New Year out right with a good, hearty breakfast. Or lunch. Or dinner. Find more inspiration at Inspiration Monday, Busy Monday, Inspire Me, Inspire Me2, Fabulous, Show and Share, Wow Me, Wow Us, Whisk It, Hearth and Soul, Weekend Potluck, Awesome Friday. Combine the broccoli, onions and peppers in a large bowl. Drizzle olive oil over and stir well so that all the vegetables are coated. Transfer to a large baking sheet and sprinkle with 1 tsp. salt. Roast at 425 for 15-20 minutes or until vegetables are tender. In a large skillet cook the bacon on medium heat, stirring occasionally, until it is crisp. Using a slotted spoon, transfer the bacon to a paper towel-lined plate and reserve. In a separate bowl, beat the eggs thoroughly and whisk in the half and half and milk. Add the remaining teaspoon of salt, and black pepper. 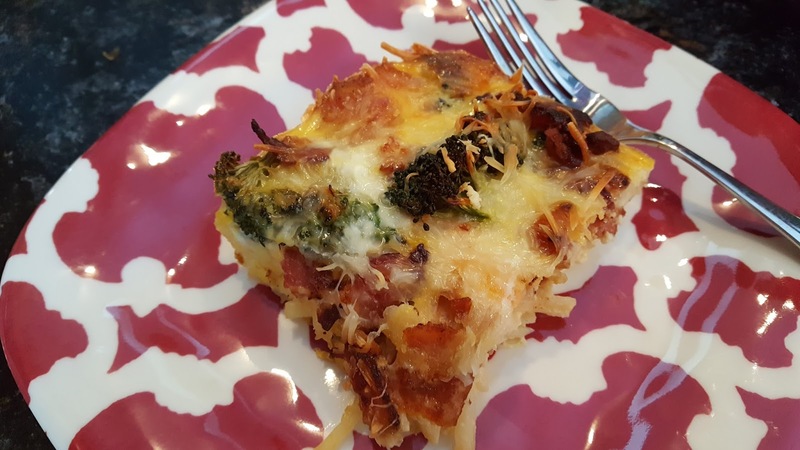 In a greased 9x13 baking dish, layer the potatoes, vegetables, bacon and cheese. Pour the egg mixture over the top. Bake at 350 for 40 to 45 minutes or until the eggs are cooked through and set. You may refrigerate the casserole overnight before baking. Adjust the baking time to add 5-10 minutes more. Serves 12.